Man, I am so excited. I finally tried my hand at harissa, and I couldn’t be more pleased. 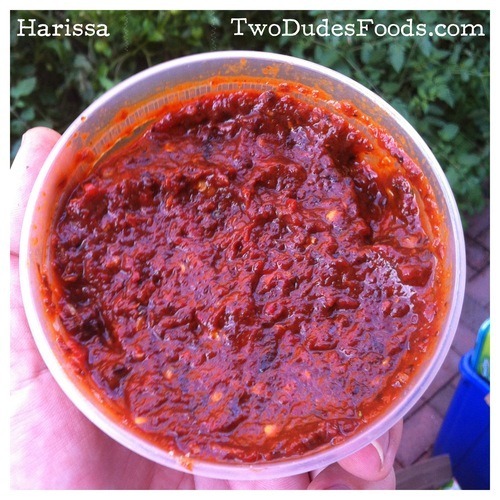 Don’t know if you’ve ever had harissa, but back when I was selling hummus, a company from D.C., called Cava, was demo-ing some harissa next to me, and I fell in freaking love with it. My method was quite simple. I roasted the red pepper and sun dried tomatoes at 350 degrees. I pulled the sun-dried tomatoes out after about 10 minutes, then kept roasting the pepper about 20 more minutes. After it was roasted, I let it cool until I could handle it, and I pulled the skin off. Meanwhile, I submerged the ancho peppers and ghost pepper in a glass of water. Likewise, I soaked the now roasted sun-dried tomatoes in a separate glass of water. Then, I simply combined all the ingredients in my food processor, adding a few shakes of each of the seasonings. I used the lemon juice and red wine vinegar for flavor, preservation, and pasty consistency, 1 tablespoon at a time. In all, I think I used 3 tablespoons of lemon juice, and 1-1/2 or 2 of red wine vinegar. Added a little more salt, and bam. I have a delicious African condiment. Goes great on sandwiches, meat, pita bread, mixed with hummus, whatever! I’m not sure roasting the sun-dried tomatoes was necessary, so next time I’ll probably try it without and see how it compares. Since North Carolina is basically your next door neighbor, I doubt I have to be the one to tell you that North Carolina barbecue rocks. 2. I love spicy food. 3. I love to eat pigs. On a side note, I think it’s funny that the word “barbecue” to a North Carolinian means pulled (or chopped) pork and a spicy vinegar sauce. My homeboy Brotha SouL gave me a blank look when I talked about barbecue chicken, or barbecue ribs. To him, Barbecue is a noun meaning only pulled pork. I guess they call the other stuff “grilled” or something? I don’t know. Anyway, I have only recently begun to enjoy the wonders of NC barbecue. My first exposure was when I made a sauce recipe from Amazing Ribs. I could practically drink the stuff. But the first time I tasted actual, authentic barbecue in NC was last summer. My life was changed. I like mine with a lot of black pepper…it just smells and tastes awesome, especially with the vinegar. Anyway, I made two 16 oz. Mason jars a couple of months ago. Wonderful stuff. Oh, and it’s best if left overnight for the flavors to blend. And shake it up whenever you think of it. Now, the tacos. The tacos are easy. Get some pork. Doesn’t really matter what kind, or how much. I put three pork chops in my crock pot, and poured the sauce over them. Cooked it on low all day. About 6 or 7 hours in, I pulled the pork out, shredded it with a couple forks, and then put it back in the crock pot. When I was almost ready to eat, I made a simply pico de gallo with diced tomato, red onion, fresh jalapeno, cilantro, salt and pepper. I poured some of the barbecue sauce over it and let it sit for about 10 minutes to soak up the flavor. Meanwhile, I warmed some flour tortillas in my cast iron skillet. 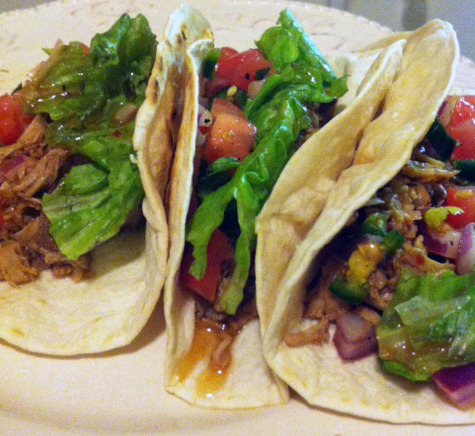 Anyway, I put the pork on the tortillas, threw on the pico, and a little bit of lettuce. Then I spooned a VERY small amount of more vinegar sauce on the top. It was AMAZING. Next time, I’m going to try slaw instead of lettuce. But I don’t think I’ll change a thing about the meat or the sauce. And I’ll probably keep the pico. I LOVE North Carolina BBQ. I used to cook at a dive bar in Charlotte called The Penguin. The place had three owners — a cook, a business man, and a maintenance guy — all with full sleeves of tattoos. Anyway, the cook-owner got his start making BBQ, and he would still do all of our meats offsite with his secret recipe. I also worked with an awesome Mexican dude named Manuel (Real name? Probably not.) and he’s the one who showed me how to make salsa. Manuel would also bring his own corn tortillas into work, and we would deep fry them to make taco shells. You already know what we filled them with! Long story short, this is gonna fill a gap that was left in my belly after I quit The Penguin.